I know the latest rebalance changes are still very fresh, but I also know people want to see what has changed in the metagame. First of all a few words about the rebalancing – this time SBE has listened to the community and asked a few players about their opinion on the patchnotes – I was one of them. So I made my comments and had some interesting discussions with them and hope they will ask me again in the future. Everything was a little last minute and I couldn’t play with 120 life, but it was still great to see SBE listening to their players. And after a week of playing with the changes – it looks very promising to me. The biggest of all changes is that the starting health is now 120 instead of 100. I think this had a bigger impact on the game length than any of the card changes before. What I can say right now is that 120 health seem to be quite a good spot and games usually end 1-2 turns later. Only the decks that abuse card draw should probably be on the watch list – not because they are too powerful or can’t be countered, but they are simply incredibly consistent in executing their game plan and often not really interactive to play against. Right now I see that more or less as a shift in the meta – you need to be prepared for that or you will lose to infinite combos or huge bombs. What impact did the nerfs have? 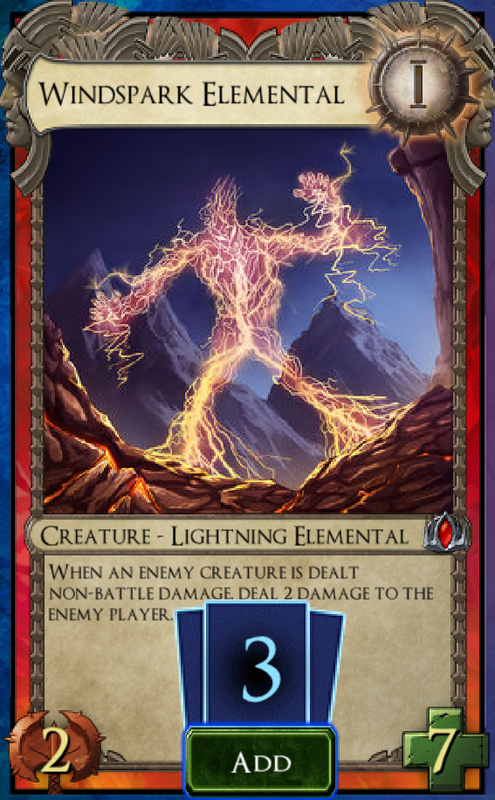 The biggest impact was probably the nerf of Windspark Elemental. I thought it was a little harsh, but I agreed (and said so before) that it limited design space and can understand that something had to be done about it. What impact did the buffs have? The biggest buffs were given to Oros, Battebrand, Echowisp and Scatterspore Eidolon. After the Oratek Explosives nerf, the classic AT Goodstuff deck took a huge hit and the Battlebrand buff aimed to give AT some of that power back in a more defensive manner – seems to be a good call. The other buffs (along with the Windspark nerf) actually boosted Mono Uterra into the realm of playability! Something I didn’t really expect. So I really like those. Was there something I would have made different? For me the only thing that I disagreed on is that they didn’t revert the lvl3 Chrogias to not having lifegain. I think SBE was really happy that Chrogias was played over Iron Maiden in AU after the latest buff, since Chrogias tells that cool story (much more than Iron Maiden) and by nerfing Chrogias, Iron Maiden would simply see more play and the power level of the two cards is quite comparable. Unlike in Hearthstone there aren’t really class cards in SolForge – we only have allied cards and cards that shine in mono faction decks. I would actually like that the class defining cards in SolForge have a more comparable power level. I think SBE is very well aware of this issue, since quite a lot of the heroic Allied cards (and the Avatars) got a buff in the rebalance part 1, but there are still some missing. First of all I think not only Oratek (Battlebrand) and Dysian (Siphon) deserve good allied rares, but also the allied rares from set 2 (Byzerak Drake, Esperian Wartusk, Onyxium Marauder and Umbruk Glider) should be equally good. A little tweak in stats – similar to the Oros buff could go a long way. By making some of them more powerful the lower rarity formats could also get more balanced. 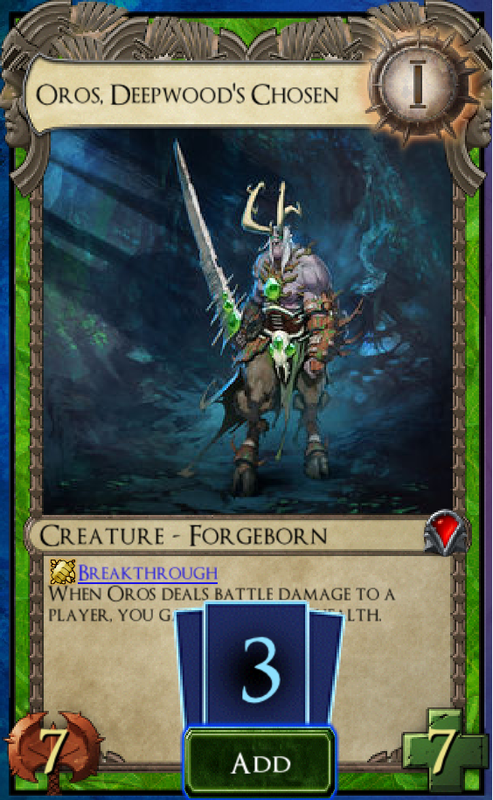 I think Ironbound Reinforcements and the Cinderbound Barbarian might need a little stat tweak to make the cycle more balanced and give new players more accessible tools at a lower rarity (while teaching them what good underdrops are). It would also be great to buff the Patron of Anvillon and the Patron of Kadras. My reasoning is that Patron of Tarsus/ Deepwood push an entire archetype and it would be awesome to see other competitive mono builds. Enough talk! Where are the decklists? I haven’t even talked about the meta so far! There are viable control decks for AT, AN and AU right now and they are certainly a force in the meta – more than ever before. Against those decks you either have to swarm the board, play some of the counters (Anvillon Arbiter, Aetherphage or Leyline Demon) or have a deck with aggressive creatures. From the decks that try to swarm the board there is Mono Uterra and AU GrowBots – at least they seem to be the strongest ones. I’m sure there is an NU grow wide list out there as well, but I haven’t found one yet that I’m happy with. For the midrange archetype there is AT Alyssa (don’t confuse with the control Alyssa list with card draw), Mono N and NT Tempo. I guess it would be easy to build an AU Midrange list as well, but I haven’t seen them so far. For the aggro archetype there is only UT Aggro and UT AtorSaurus and maybe AT AggroBots, but I haven’t played with that deck yet. As you can see we have a much more archetype defined meta than we ever had before! The aim of this deck is to get an Ignir lvl4 as soon as possible (3.1 – 3.2). Set up your draw engine and bring him to lvl4 with either a Killion 3 or a Steeleye Seer 3 in PL3. Once you get Ignir lvl4 he usually wins you the game. This deck isn’t that easy to pilot, but it’s always awesome to cheat in some lvl3 forgeborn before rank 4. This is one of the less greedy AU builds, but it has all the tools (with Nova and Arbiter) for winning the control mirror. Without arbiter you will more or less always loose against AN Kitfinity and it’s a great tool against lots of other decks as well. This deck tries to level its draw engine and thin its deck as much as possible (eight Overload cards) in order to go infinite. This usually happens around 3.3-3.4 and then this deck can insta-kill your opponent by playing Soul Harvest as many times as you want with a Crypt Conjurer on Board. When playing against this deck, please be aware that removal doesn’t really help and if you should ever hit PL4 against it, you have probably lost the game already no matter what the board state or life totals are. As mentioned above this deck was kind of a surprise for me. It is able to win against the more midrange oriented decks with the help of Bramblewood Tracker and can flood the board very fast against control decks (use Aetherphage to have some protection against Ambriel’s Edict). Call the Lightning is simply used as finisher in this deck and helps against control a little more. This deck has a hard time against AU GrowBots when they play Leyline Sentry and playing against NT can also be rough. A nice feature about this deck is that more or less all the legendaries besides Enduring Vitality aren’t essential for this list. So if you are missing a few of those replace them by something similar and the deck will still be good. As sad as it is, this is probably the cheapest of the tier 1 decks right now (6 Legendaries, 22 Heroics, 2 Rares). This version of AU GrowBots covers the full “hate” package of Arbiter, Aetherphage and Leyline Sentry so it doesn’t have a lot of awful matchups. It often struggles with decks that can remove Arcflight Squadron easily, since he is key to flooding the board and helps you to level additional cards early on. Some people play Thundersaur instead in Aetherphage (as a mirror breaker), but a well timed Aetherphage will often win you the game on the spot against control decks. I can actually still remember that Turkis brewed this deck for the first time during set 4 or 5 and it seems that he has successfully made this archetype viable again. Ator enables your lifegain on hit attackers immediately and makes it possible to cast free spells with Everflame Mystic to buff your Wegu into his activation range. If you want to see this deck winning, check out the first episode of Trials of the Forgeborn on SBE’s official twitch channel. This is my personal favorite of the aggressive decks. You usually only play Bron early on if you hit the combo – only play Warclaw without him if he is the best option to block a threat. It’s also worth playing the full dino package just for Thunderstomp – that spell is really awesome and allows you to deal with multiple threats. The Alyssa deck got much more greedy with the latest rebalance, but it’s still very viable and has lots of solid matchups. In this version Alyssa is only one of your win conditions and you can also level your bombs like Ignor is Scorchmane Dragon. This deck is still incredibly potent against a lot of decks – even after some nerfs of the latest rebalance! Against Control decks just make sure to level your Ignir and Zarox and you should be fine. Against other decks try to set up a good turn with Rage of Kadras and try to snowball from there on. I actually went 4:0 with this deck (and I didn’t even want to play with it, since I mixed decks up and selected the wrong one). This deck is brought to you by Zwaxor and he made a youtube video about it. I would probably build the deck slightly different, but I know the archetype is very powerful and he’s an NT expert so here we go. Right now the meta isn’t very Nekrium heavy so it’s Xerxes time to shine and with the help of Patron of Tarsus you can often steal a creature while decimating the board. Where are the fun brews? I made a reddit thread where I asked people for their fun brews. I will feature a few of those lists here, but there are many more fun decks to try there. This deck is of course of not top tier competitive, but it’s much better than you would initially think. The aim is to get a Forge Guardian Omega lvl1 from Sparky lvl3 sacrificing another Sparky lvl3. Basically all the cards in the deck help you to archive that. Especially Varna and Immortal Echoes are key to bring back a bunch of the Forge Guardian Dogs. Also Marty and War Tinker will always generate a Sparky, which is also very handy. I wanted to feature this decklist, because it has some pretty cool combos that aren’t directly clear if you never played with this deck. The core of the deck is similar to the Mono U GrowWide list above, but with this deck you try to exploit some of the interactions with Enduring Vitality and health gain in general. E.g. if you have 3 Enduring Vitality active and play Tuskin Grovekeeper and then Everflow Eidolon, Enduring Vitality will trigger Eidolon three times and that will trigger the Grovekeeper 3 times, netting you 3 6/6 tokens along with the other two cards – pretty cool, huh? Apart from that Vigorwisp can heal your creatures when coming into play, or Rubyscale can generate tokens with Grovekeeper and all that kind of shenanigans. If you want a more competitive version just put Grovekeeper and Eidolon into mono U and it will be a pretty good deck with some of the cool interactions. This deck has been revisited by Pion and one of the cool interactions is that you can use the cards generated by Valifrax to get the trigger for your Ironmind Acolytes. You can see this deck live in action on his twitch channel. Out of curiosity, what would you build differently in the last decklist? For my liking it’s a little to removal heavy. I think you can safely cut one Death Current and the Dreadbolt. Now it really depends on which matchup you want to optimize – against grow wide I think epidemic is a great choice and you could add a Zarox (or another Echoes). I think also a 2/2 Zarox and Ignir split could be good in this list (I mean how can you not play Zarox – you designed that card, right? :P). I also think Duskmaw should also not be out of consideration – he can still generate great tempo plays and combines well with Xerxes. It really depends on how much of the hate cards – Arbiter and Leyline Demon are played in the current meta (they are played quite often – so I can agree on not putting him into this list). The Dreadbolt left instantly in favor of another Epidemic. Death Current and Spiritcleave I think are far too important as underdrops to be cut in a deck like this. Zarox I might try out, though, just because having a grimgaunt-esque effect available is always amazing. I’m skeptical about Duskmaw at this point because of his relatively low power compared to before contra the effect he has on your draws in general. Yeah the Dreadbolt felt kind of odd. I mean you could also try to cut a GGD and the Dreadbolt to add 2 Zarox if you are happy with 5 Tempys cards. The only thing I wanted to point out is that Duskmaw is still stronger than people do give him credit for at the moment (also by not directly killing you have additional Xerxes synergy). Good job and thanks for the article. But won’t Steeleye discard level 4 at rank 3? Killion steel works.